Its been a while since my last post so I decided to make it worthwhile :). I was recently checking a friend’s site for the classic Web application vulnerabilities, when I found a reflected XSS attack. While I was investigating the bug, I noticed that while the bug worked on Mozilla’s Firefox, it didn’t work on Google’s Chrome. As it turns out, Chrome uses an Anti-XSS filter, based on static analysis, which attempts to detect XSS. If it detects such an attempt, it filters out the injected code, and effectively stops the on-going attack. 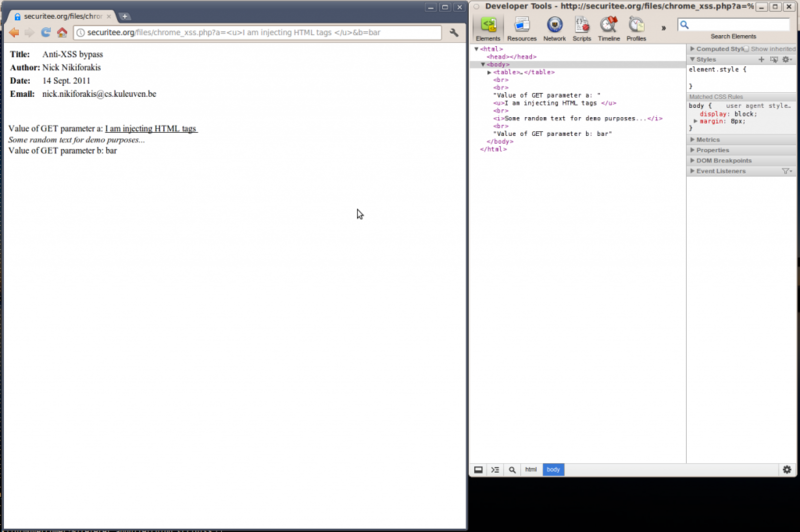 In order to demonstrate this, I made a vulnerable page at http://securitee.tk/files/chrome_xss.php. This page simply reads two GET parameters, namely a and b, which it then prints out in the resulting page. To show that injection is possible, I start by injecting some HTML which is indeed rendered as part of the HTML page. And indeed, it worked!!! The multi-line comments mean nothing to the HTML but mean the world when they are placed in a script environment 🙂 In summary, all you need to bypass the XSS filter is to have at least two variables under your control, and break up your injected script, with the help of multi-line comments, to use both. Now if you look at what’s happening here, all I am doing is adding a double-slash comment right at the end of the first controlled variable. This shouldn’t make any difference since we are already in comment-mode but apparently it does. If I would have to guess, I’d say that they have really hard-coded the multiline comment rule in their filters and any small deviation will still do the trick. This entry was posted in Breaking stuff. Bookmark the permalink. Good one . Opens some new door to XSS in general. interestingly noscript had no problems blocking the offending split script. [NoScript XSS] Sanitized suspicious request. Original URL [http://securitee.org/files/chrome_xss.php?a=%3Cscript%3Ealert(1);/*&b=*/%3C/script%3E] requested from [chrome://browser/content/browser.xul]. Sanitized URL: [http://securitee.org/files/chrome_xss.php?a=%20script%3EALERT%201%20%3B%2F*&b=*%2F%20%2Fscript%3E#9551845861820314641]. how it did follow the script through the multiple parameters however..
concatenating alone would not be sufficient enough I think. 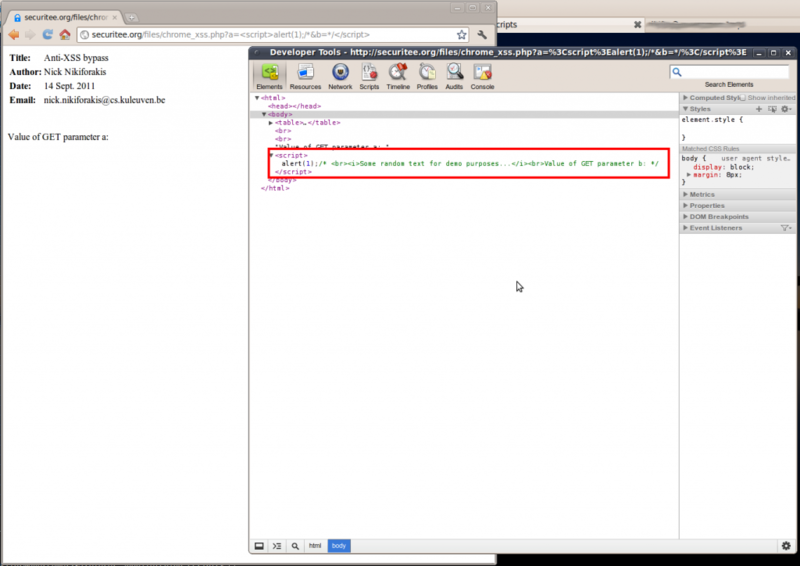 The HTML could include the parameters in another sequence than the sequence of the GET parameters. So you somehow need take the internal ordering into account. Which is very difficult if you do not know the internals of a web page. Honestly I don’t think the problem is with Chrome’s anti XSS filter as this is supposed to just be a security blanket for stupid developers. 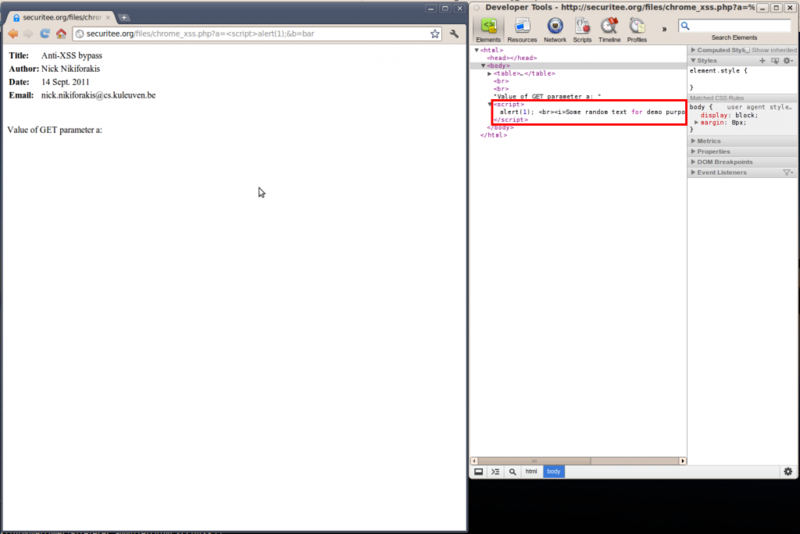 At the end of the day Chrome is just doing what it can to help with the most common XSS styled attacks to protect its users and it falls on the hands of the developer of the vulnerable web app to ensure their code is not vulnerable in the first place. If Chrome can fix this bypass that’s great, if not, hopefully it keeps pressure on web application developers to ensure their code is secure instead of thinking, “It’s cool, Chrome will stop the attack”. I agree to the idea that a developer should be responsible for vulnerabilities on a website. We cannot depend on browsers to protect us from web attacks since there still are a million ways to bypass filters. If the developer can code securely, all bypass techniques are useless. A good read! Another method might be to use a textarea. Leaving this tag unclosed will load all following HTML/JS into a hidden textbox. So … there is another attack possibility, rather than having to have 2 *separate* parameters to inject into a page – it’s conceivable to have the same parameter echo twice, and have an attack crafted that would effective still do the same thing? I don’t have a sandbox to test – but I suspect it can be done? Actually this is how initial filters of XSS in .NET framework were compromised. Hey! This is really good and well though out. I don’t believe it works when sites only allow the user to input one variable instead of two though. Any ideas? No, this method, and its variations, require that you control at least two output variables. I see. Thanks for the reply! As you may or may not know, I am a PhD student in Computer Science so, with your permission, I will approach your comment, scientifically. 1) You say “there are ton of filter bypasses”. Where are the references towards this “ton” of resources? Should I take your word for it or can it be shown to me, objectively, that you are right? Again, as you may or may not know, my original blog post (without the two updates) was voted one of the top 10 Web hacking techniques of 2011. Strange that I would be voted for such a thing if there was a “ton” of bypasses and the filter was “known, not to protect”. 2) You say that the filter is “not even maintained”. Again, if you would have taken the time to read through the whole blog post, you would have found out that, twice over the last year, I published a way around the filter and twice the bypass was fixed (this last one is my third one). Again, what a strange behaviour for a filter “not even maintained”. 3) Your writing style is pseudo-friendly (even though we are not friends) and marginally derogatory, which is something that I do not enjoy, especially given the lack of any real content in your comment. In short, your comment is rejected. If you think you are right, please revise and resubmit. Although your latest “hack” still works in the latest version of chrome, it failed on Internet Explorer 9.0.8112. This doesn’t mean IE is more secure than Chrome, but shows XSS can be, at least, mitigated if enough thought is put into it. Nevertheless, I, like others posted here before, share the belief that it’s not the browser’s but the web developer’s job to prevent XSS attacks. This is really good and well though out.I agree to the idea that a developer should be responsible for vulnerabilities on a website. Great post, I think these days it is getting harder and harder to get round filters on both website and browser level. So information like this can only breed new methods. Great article. I have a question concerning the last bypassing technique. Is it possible to combine the last updated one (void..etc.) with another bypass technique like putting “> in front of the opening script tag? Or will the javascipt engine get confused? Just tested in version 38.